A few people gathered yesterday in front of the green kiosk which stands on the pavement of Market Place on the East side of St Mary's Church. The kiosk is in the news for the second time in recent weeks after a competition to decorate it was announced by the Market team at Action Acton (see link, right). This visit was prompted by the Churchfield Community Association (CCA) and the Poets Corner Residents Association (PCRA) who jointly wrote a letter to Jason Stacey, Leader of Ealing Council to ask him to remove it. 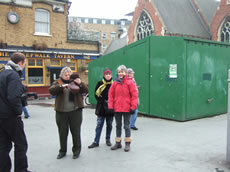 The letter stated: "This shed is an eyesore and detracts from Acton’s finest historic building, St Mary’s Church. 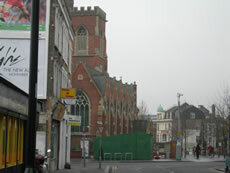 As the enclosed photographs clearly show, it ruins the view from Churchfield Road of this important listed building. The two associations, representing local residents and businesses, are committed to campaigning against this grotesque ‘kiosk’. "As we understand it, the location was chosen as a matter of convenience, since water and electricity were available there. The planning assumption was that the building would be used as a genuine kiosk to sell tea and coffee or newspapers etc. One year on, no such use has emerged and we understand that the structure is regarded as unfit for any such purpose. We are unaware of any attempts now to obtain a tenant to run any kind of business or service from the ‘kiosk’. It is clear that the structure’s only function is as a storage unit. If that is the case, it is totally inappropriate to have a storage facility without any architectural merit in such a prominent location. "We do recognise that the market (which we support) must have somewhere to store their stalls. We have examined the area and we are sure that alternative and more discreet sites can be found. • Premises at 137 Churchfield Road which have stood empty for many years could be acquired and used as offices for the market team with storage in the rear yard. • In the yards behind either Morrison’s or the Post Office. Copies of the letter were sent to Cllrs Wolodymyr Barczuk, Seema Kumar and Marie Randall, and also to John Blackmore, Chief Executive of Action Acton. The gathering was prompted by the presence of a photographer (named Zute) and a journalist (Claire) from the Ealing Gazette, there to view for themselves the structure which has prompted much negative discussion amongst locals. Mary Stewart of the PCRA told us afterwards: "The photographer and the journalist agreed with us that that 'thing' is terrible." 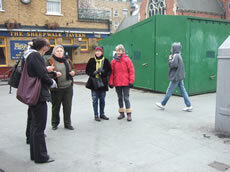 Mary continued: "At a recent CCA meeting I brought up the subject of this eyesore which blocks the view of the Church. The Executive Committee decided to have a vote and all present voted unanimously that the kiosk should go." "We also showed the Gazette yesterday the telephone box adjacent to the kiosk out of which a large trail of urine was coming." Barbara Mullarney Wright, also from the PCRA and at the kiosk yesterday, told us: "The last thing we want to do is to detract from the wonderful competition, run by Action Acton, to choose a mural to put on the kiosk. People have put so much thought, effort and creativity into their entries and we really don't want to affect that in any way. All we want to do is to find the right place for this kiosk to be. It would be a shame to overlook the positive creativity which organising the competition has brought about. "I think it's so nice to see people participating in this and thinking positively about Acton. Let's just try to get this kiosk in the right place looking as good as it can, rather than upsetting people."